Thought leadership content is vital to your overall content strategy. Publishing an article on a controversial or cutting-edge topic in an online publication establishes you as an authority in your field, enhancing your brand and making potential clients and customers more likely to do business with you. Compared to other content marketing efforts, it’s particularly valuable. For example, we all know blogging is important for increasing traffic, boosting SEO and creating trust with your readers. But blog posts exist on your website only — and if your site doesn’t attract a lot of visitors, your articles will go unread. On the other hand, a successful thought leadership piece could be published in the opinion or industry expert section of popular sites like Forbes.com, Huffingtonpost.com or even the New York Times. These websites already pull in huge numbers of visitors, bringing thousands more eyeballs to your writing. But creating thought leadership content can require a lot of resources – and you simply don’t have a blank checkbook or unlimited time to devote to it. It would be awful to spend hours on a huge effort only to get a series of “no, thanks” from editors in return. Wouldn’t it be a relief to know what editors want to see and potential clients want to read? Lucky for you, we have a hack for this. Our trick (although it’s not really ours – more on that below) uncovers the most popular, widely shared articles and guides you through the process of leveraging these pieces to create similarly beloved content. Think of it as the fast track to creating thought leadership pieces that will bring the most bang for your buck. Our hack is called the Skyscraper Technique. It’s a straightforward process to find content that’s already popular and make it better, either by expanding on the topic or adding a unique or provocative spin. This technique is usually used to increase blog traffic. Brian Dean is a famous proponent; he claims to have driven up visitors by 110% in just two weeks with this process. 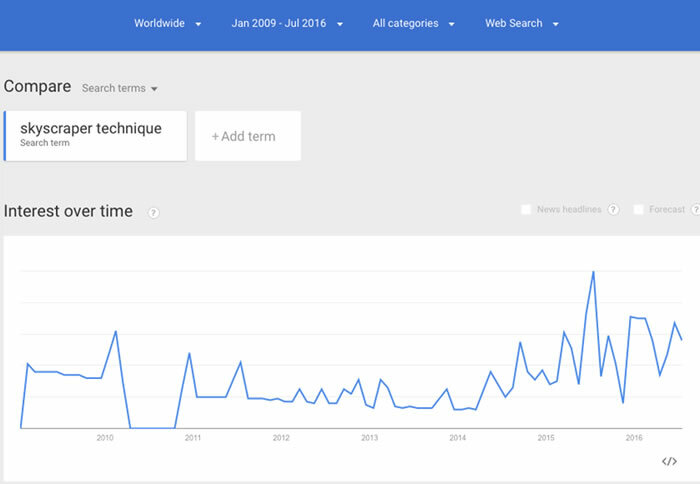 And it’s become pretty popular since about 2009, as we can see from this Google Trends search on the term. However, some have pointed out that the Skyscraper Technique isn’t ideal for all blogs. In the unskilled hands, the Skyscraper Technique results in a lot of long, bloated blog posts that don’t add value, leading readers to lose their appetite for reading blog posts in the first place. Editor's note: For a great breakdown of a better approach to creating awesome blog posts that your audience wants to read -- without all the rigamarole of producing 2,000-word novels that no one has time to read -- we suggest this post on increasing blog traffic and engatement from Nadya Khoja at Venngage. The Skyscraper Technique might be derailing some blogs, but we think it lends itself perfectly to thought leadership content – precisely because it directs you to topics that have proved their popularity. Using this technique, you can quickly find a compelling, in-demand topic and identify the gaps not being served by what’s already out there. Add your unique viewpoint and voila, you have thought leadership! Let’s say you’re in the video marketing field. You want to write an article for a major website (the Huffington Post maybe?) that will establish you as one of the big names in this niche. 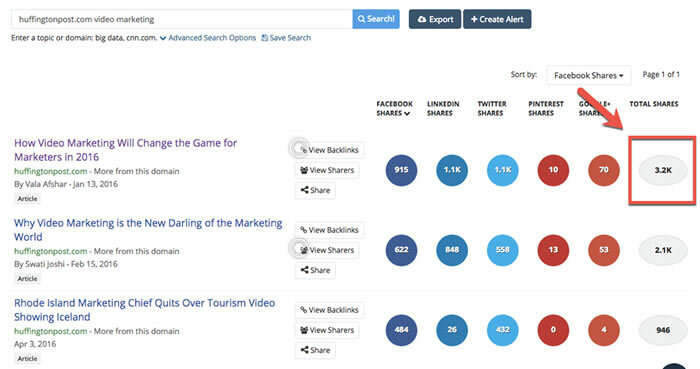 BuzzSumo makes it super easy to find the content that users love. For our example, let’s search on “Huffingtonpost.com video marketing,” which yields a long list of video marketing articles published by HuffPo. You could also search on “video marketing” and get a list of all related articles across a variety of websites. 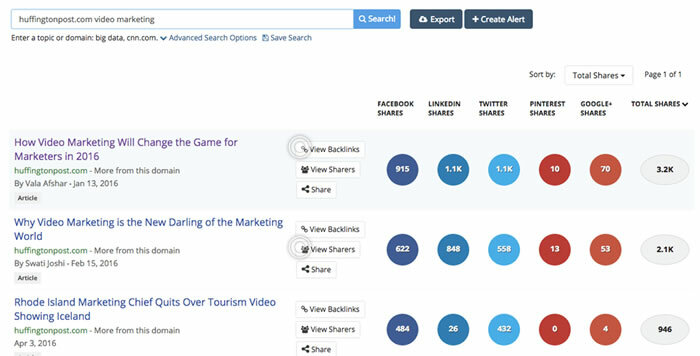 Sort by Total Shares to find the most popular video marketing articles on HuffPo. In our case, the article has a healthy 39 backlinks from reputable sites. Perfect! Now it’s time to see what this article has to say, so that you can identify what you can add to the conversation. Our chosen piece provides a plethora of potential ideas – from the importance of customer testimonial videos, to personalized viewing experiences, to the rise of video distribution channels other than YouTube. It’s a snap to pick the most interesting of these possible topics and add our own spin to it. The video marketing article we’ve identified repeatedly mentions the B2B sphere, suggesting this is fertile ground for amplification. Using this insight, we might decide to write a piece that focuses solely on the B2B market — perhaps “The Rise of B2B Video Marketing: What Every B2B Company Needs to Know.” We’ll use statistics (new ones if possible) that make our case that video marketing is important for B2B, and then list the various takeaways for businesses. Finally, your thought leadership article is complete – hooray! Now comes the last and most important step: getting it published. The first place to approach is the media outlet that published the original article – in our case, the Huffington Post. In your pitch, reference the base article and share its metrics. This helps makes your case that a similar article would be a hit with the publication’s readers. Striking out? Don’t worry – you can still use the piece. Just post it on your blog and promote it through your social media channels. You can even go back to the list of websites that linked to the base article to see if they’ll give you a backlink to your post. Because the Skyscraper Technique provides a shortcut to getting published, you get the benefits of thought leadership content with less effort. Considering thought leadership pieces are a superpower of the content marketing universe — helping you demonstrate your expertise, attract and retain clients and increase revenues — we think this is a hack worth trying. Ready to give it a whirl? Let us know in the comments how it goes! All great content marketing starts with a documented strategy. In fact, only 32% of businesses that don't have a documented strategy feel their content marketing is effective. If you haven't yet formalized your own content strategy, fear not ... our Complete B2B Content Strategy Guide provides guidance and lots of helpful tools to get you started! Susannah Noel is a guest author for Clariant Creative and the cofounder of Noel Editorial and Editorial Arts Academy. In addition to editing books and teaching others how to succeed as an editor, she's a copywriter specializing in financial services and health. She lives in Montpelier, VT. Read more about Susannah at susannahnoel.com.